One of the ways I am trying to feed my family more healthily is to increase our intake of seasonal vegetables while reducing the amount of red meat we eat. 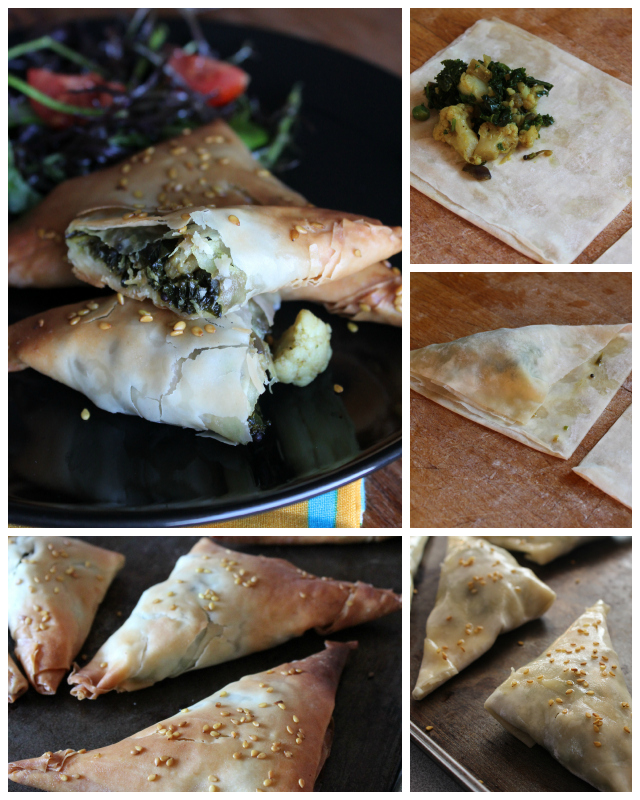 Normally I love my samosas filled with spicy minced lamb but this version with kale and cauliflower is every bit as tasty and much, much better for you. I wasn’t 100% certain my children would be so taken by them though, so I was extremely pleased when they gave them their seal of approval, with Jessie, my oldest, happily tucking in to seconds and then thirds. We enjoyed them as a light lunch served with salad and plenty of homemade mango chutney and a simple raita. They’re also a fab way to get through some of those big bags of kale predominating veg boxes at this time of year. 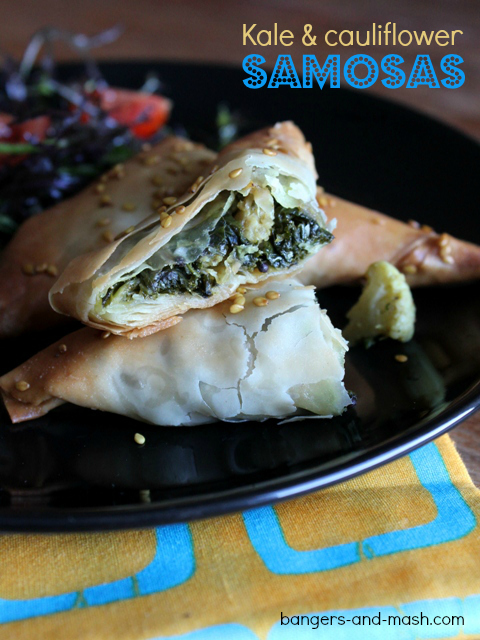 My kids tend to groan a little when they see kale served up again as a side dish, but they certainly didn’t moan about eating it in these samosas. Result. This recipe is based on the Potato & Pea Samosas featured in Indian Food Made Easy by Anjum Anand. Steam or boil the cauliflower until just tender. Set aside. Heat the oil in a medium-sized saucepan and fry the mustard seeds until they start to pop. Add the red onion and ginger and cook gently for about five minutes until softened. Then add the garlic and fry gently for a couple of minutes, careful not to let the garlic burn. Place the chopped kale in the pan with a splash of water and cook for around 3 or 4 minutes until the kale has wilted down. Add the cauliflower florets and frozen peas and give everything a good stir together. Add the ground spices, salt and chopped coriander, mix again and cook for another couple of minutes. Unroll the filo pastry and peel off a single sheet. Cover the remainder with a damp tea towel so they don’t dry out. Lay the sheet of pastry on your clean work surface and brush with melted butter. Fold down a third of the pastry lengthwise, brush with more butter and fold up the remaining third. Your strip will now be triple-layered. Cut in half so you have two strips of about 10cm long. Sprinkle the samosas with sesame seeds and pop in the oven for 20 to 25 minutes until crisp and golden brown. Serve with salad and chutneys. As these samosas are deliciously healthy, I’m entering them into my current Spice Trail challenge which has the theme ‘Temple Food’. And since the kids loved them so much too, they’re a perfect entry for January’s ‘Healthy Kids’ Family Foodies challenge, this month hosted by Louisa at Eat Your Veg. The theme for this month’s Tea Time Treats is ‘Packed Lunches’, and so as these are also delicious served cold I’m linking this up there too. Tea Time Treats is jointly hosted by The Hedgecombers and Lavender & Lovage. I’m also entering my samosas into Allotment 2 Kitchen’s Vegetable Palette challenge, where the theme is ‘Feel Good Vegetables’, and the Extra Veg challenge hosted by Utterly Scrummy and Fuss Free Flavours. For an up-to-date list of foodie challenges, giveaways and competitions, visit The Food Blog Diary. What a great recipe! I think it may even get my children to eat kale without even noticing. I love these, kale and cauliflower are my favourite vegetables. British winter meets India. Perfect! Super use of lovely seasonal kale Vanesther! My kids are really not taken with it but I’m betting in samosa form they might be finally won over, so going to try. And serves to remind me it’s been way too long since I last made samosas. Thanks so much for linking up to Jan’s Family Foodies ‘Healthy Kids’ event, just perfect. Everything tastes better in a little parcel! These are so authentic looking and so good for you, lovely recipe, thanks.